Google today updated Google Calendar for Android and iOS devices with a new smart scheduling tool. 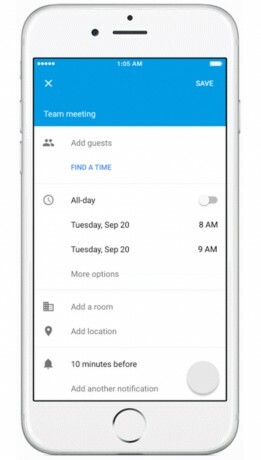 Users can now tap a "find a time" button and Calendar will automatically suggest meeting times and available rooms based on preferences. The tool takes into account all attendees' availability, as well as meeting locations. It will suggest times with the fewest conflicts, help to reschedule conflicts, as well as include several backup suggestions. As always, the person scheduling the meeting has control over the time and location finally selected. The new smart scheduling tool is free to use in Google Calendar. The updated apps are available for download from the Google Play Store and iTunes App Store. Google says this feature will reach the web version of Google Calendar by the end of the year. Microsoft today updated its Outlook email and calendar app for Android and iOS devices. The refreshed communications and scheduling tool offers a number of new features aimed at the calendar. Google this week made significant change to its core productivity suite, including its email, online storage, and messaging tools. Gmail gains support for add-ons from the G Suite Marketplace, which will let third-party companies create small apps that can hook into an enhance Gmail.